toys assorted childrens play pretend items - telephone etc. SHOE STRING EXPRESS allows the child to use their imagination with things which are already in the kitchen pantry. They can take the two wheel bases and fit them with cartons, plastic bottles of tines from pantry, join them altogether and you have a long train. There are four boxes in total. 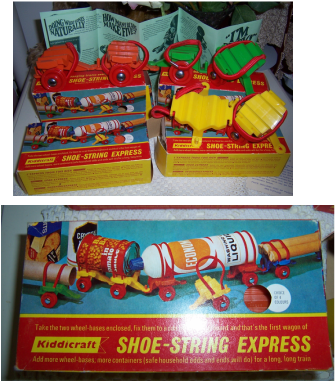 Truly remarkable to have the toys still in their original boxes and unused with original leaflets.